The Trump campaign says former aide Omarosa Manigault Newman violated an agreement she signed not to disparage Trump or disclose proprietary information. The president launched a volley of angry tweets in response, describing his former aide as a "crazed, crying lowlife" and "that dog." White House spokeswoman Sarah Sanders said the tone of the president's tweets reflected Trump's frustration with Manigault Newman and the media attention she has received. "This person has shown a complete lack of integrity," Sanders said. Now, the Trump campaign is taking legal action. "Donald J. Trump for President, Inc. has filed an arbitration against Omarosa Manigault Newman," said a campaign official in a statement. The claim accuses the former staffer of violating an agreement she signed before joining the 2016 campaign, in which she reportedly promised not to disparage Trump or disclose proprietary information. The campaign did not elaborate on the nature of the alleged violation. But Manigault Newman was defiant, telling the Associated Press on Tuesday, "I will not be silenced." The reality TV star, who became famous while appearing alongside Trump on The Apprentice TV show, later made secret recordings of the president and others. She has shared some of those tapes during her book tour. Trump has denied that claim, citing a conversation he had with Apprentice creator Mark Burnett. 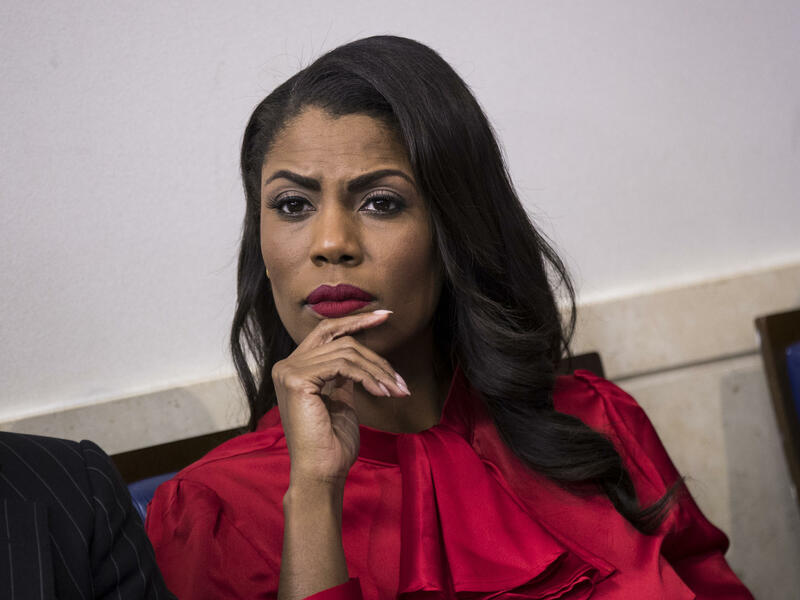 Burnett "called to say that there are NO TAPES of the Apprentice where I used such a terrible and disgusting word as attributed by Wacky and Deranged Omarosa," Trump tweeted Monday night. "I don't have that word in my vocabulary and never have. She made it up." Manigault Newman pointed to Trump's derogatory comments about her on Twitter. "If he would say that publicly, what else would he say about me privately?" she asked during an interview with MSNBC. "He has absolutely no respect for women." Manigault Newman's attorney, John Phillips, said he had not yet seen the Trump campaign's arbitration action. "At this time, we haven't seen any legal action and don't have a comment on it," Phillips said. "Her legal team will address these matters appropriately when they arise." Sanders denied that Trump's attacks on Manigault Newman were racially motivated. "This has absolutely nothing to do with race and everything to do with the president calling out someone's lack of integrity," the spokeswoman said. "The president is an equal opportunity person that calls things like he sees it. He always fights fire with fire and he certainly doesn't hold back on doing that across the board." Trump had a long history in his business and political career of using nondisclosure agreements to protect secrets and keep subordinates quiet. He successfully sued a Miss Universe contestant for $5 million in 2013 for publicly complaining that the beauty pageant was rigged. Earlier this year, the Washington Post reported that Trump sought confidentiality agreements from senior White House staffers. The newspaper cited a draft agreement that included a $10 million penalty for violators. At the time, a White House spokesman disputed the dollar figure but otherwise declined to comment. On Tuesday, Sanders refused to say whether she or other administration officials had signed nondisclosure agreements, though she insisted such agreements are not unusual. "I can tell you that it's common in a lot of places for employees to sign NDAs including in government, particularly anyone with a security clearance," Sanders said.